Freshman accounting major Jake Gillis had great success in his first season as an attackman for the men’s lacrosse team. With 56 points and five East Coast Conference (ECC) player of the week recognitions after 11 games, he is one of the team’s most distinguished players. Gillis began his lacrosse career when he was three years old in his hometown of Calgary, Canada by playing box lacrosse, which is a form of lacrosse played indoors. When he was 12 years old, he played field lacrosse with a club team. 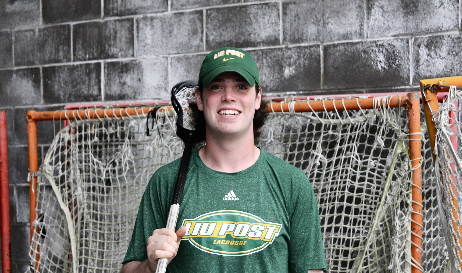 Gillis decided to go to college in America to combine education with his passion for lacrosse. “We don’t have school lacrosse in Canada other than on the east coast, and it’s not as good as it is down here, so I ultimately chose to come here because of the option to play lacrosse and possibly get a scholarship,” Gillis said. While searching for colleges in America, Post’s reputation for the lacrosse team and the business program attracted Gillis. “The lacrosse team is known [for] being very good, and I really like the coach,” he said. Head coach Eric Wolf was the deciding factor for Gillis to choose to attend Post. After 11 games, the men’s lacrosse team is 9-2 for the season and retained their No. 5 ranking in the U.S. Intercollegiate Lacrosse Association poll, and ranked No. 6 in the Nike/U.S. Lacrosse magazine. Gillis expected the team to do well, but he never anticipated having such a successful start in his freshman year. “I tend to be quite hard on myself. I look at all the bad things I did during a game, but I know that I have done some pretty good things this year. I know I’m putting the ball in the net, which is what I was brought here to do,” he said. Gillis said his individual achievements are a result of great teamwork. “All of the guys have been doing a really good job of giving me the opportunities to do as well as I have been,” he said. Gillis’s teammates mean a lot to him. He has never lived outside of Canada before and it has been hard for him to be away from his family, friends and dog, but the team helped him transition. “The team has been so good. They are like another family to me and they have made this my second home,” he said. Gillis and his second family have three games left in the regular season. 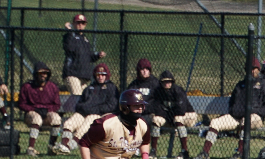 If everything goes as planned, they will move on to the ECC championships and the National Collegiate Athletic Association tournament. Gillis biggest dream is to win it all. “A big reason why I came here was to get a ring at the end of the year,” he said. Gillis wants to continue to improve his performance, but his own success is not his main focus. “The championship is the biggest deal to me right now. It doesn’t matter how many points everybody has on the field; the outcome at the end of the season is the biggest thing for me,” Gillis said.